The Small Divided Box simplifies small storage needs. It is the ideal grab and go solution for school, office, crafting, health and beauty supplies, and more. 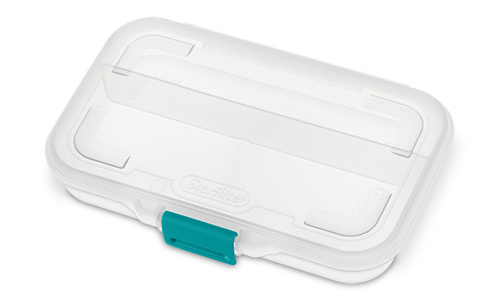 The clear base and lid allow for quick and easy identification of stored contents. The slim, space-efficient shape fits easily into most desks and drawers as well as backpacks and briefcases. This on-the-go storage solution will keep supplies easy to access when needed and is ideal for today’s hectic lifestyles. 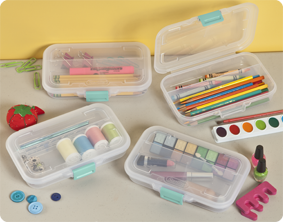 This versatile solution accommodate supplies for all ages – from grade school to adults such as pencils, pens, markers, highlighters, paint brushes, office supplies, craft/ school scissors, glue sticks, and crayons. Ideal size for sewing / craft supplies, make-up and beauty items, as well as first aid supplies. The overall dimensions of this item are 8 1/2" x 5 5/8" x 1 1/2". Overall Assembled Size: 8 1/2" x 5 5/8" x 1 1/2"
Ideal for storing school supplies, makeup, craft supplies, office supplies and more. 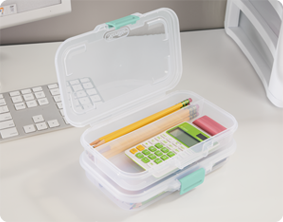 Keep your work and school items neatly stored and ready to travel in the Small Divided Box. Are you a sewer or crafter? This is ideal to keep your smaller items neat and organized and easily fits in your bag to take on the go. Small Divided Box is rated 5.0 out of 5 by 5. Rated 5 out of 5 by JimT from Small Divided Clear Box I am an Architect and use this type of box (I have a number of them) to store drafting equipment, mechanical pencils and other items I use on a daily basis. They help keep these small items organized and available to use in my desk drawers. Being clear, they are easy to locate the item I need and want. The closure clip is strong and prevents spills. I highly recommend this storage case for any type of office or desk supplies. Rated 5 out of 5 by Nick28 from Very useful product The small divided box is great. I use it to store my pens and pencils. The latch on the box allows the contents to stay securely inside. Rated 5 out of 5 by Tiredmommy2011 from Great little organizer Perfect for the little things I keep around my crafting table so they don’t get lost. Nice heavy duty well made divided box. Love that the plastic is clear so I can look really quick if what I’m looking for is there. Rated 5 out of 5 by JeffInSD from great pencil box This is a very nice sized pencil box. The latch is a lot sturdier than other plastic pencil boxes I have used. I carry it in a bag with other things and I don't have to worry about the box popping open with this one. I got two of them at a school bookstore but I have not been able to find a source online to buy more. Rated 5 out of 5 by JPTINKTINK from Handy little storage case! 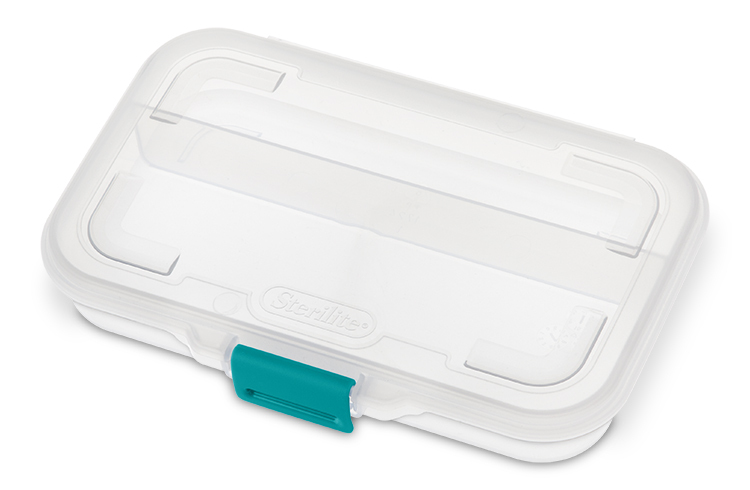 I received Sterilite model 1724 Clear for free in exchange for my honest review. I liked this container immediately upon receiving it. It is a nice, convenient size, but extremely sturdy. It has a divider to separate items. The latch closes securely and also feels durable. For now I am using it to store household cell phone cables, connects, USBs, etc. 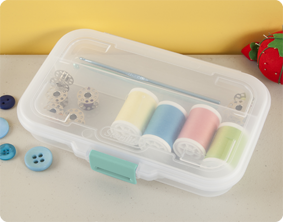 It would also work great as a craft case, a school supply case, even smaller tools.